This evocative piece is a symbol of the oppressive regime on Robben Island. Mandela's vision of the tower conveys a palpable sense of menace, which is accentuated by the coils of barbed wire around the base of the guard tower with its sinister curves which are almost tangible as they stretch towards the viewer. This piece comes in 3 parts; the colour lithograph, the motivation and the photograph. The colours Mandela uses here show how he is able to look at the brutally confining stretches of barbed wire in a positive light as he reflects on what the experience meant to him. This piece comes in 3 parts; the colour lithograph, the motivation and the photograph. 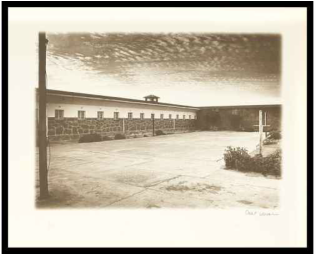 In this piece, Nelson Mandela has drawn The Ward on Robben Island. He says "On Robben Island, political and general prisoners were kept well apart. The only place where we could talk and share information with other inmates was in the prison hospital...the hospital I have sketched here served as a vital link between us and the rest of the world..." Extract from The Ward, Artist's Motivation. This piece comes in 3 parts; the colour lithograph, the motivation and the photograph. In this piece Mandela has drawn the courtyard that his cell looked onto. It was a grim wasteland where he was eventually able to cultivate vegetables which he, cut off from his family, took special pleasure in nourishing. 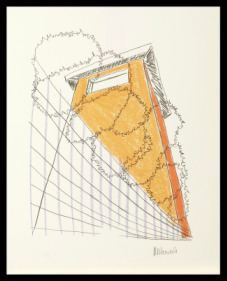 This piece comes in 3 parts; the colour lithograph, the motivation and the photograph.